How I Found It: I received it in a giveaway hosted by TLC. Summary: Simmons loves to travel and wants to visit every country in the world. Her trip to North Korea, NoKo as she calls it, is documented in this, her first book. What I Thought: I have been interested in North Korea since I read Nothing to Envy by Barbara Demick back in 2011 (pre-blog days). Demick's look into the closed country is absolutely fascinating and very engaging. It lit a curiosity and concern in me. Adam Johnson's Pulitzer Prize winning novel The Orphan Master's Son sealed the deal. Now, whenever I see a book on North Korea, it hits my TBR pretty quickly. When I had the saw that TLC, my favorite organization with which to do book tours, was hosting a giveaway of Simmons' memoir, entering was a given. I was thrilled when the publisher contacted me and offered a copy. As usual, receiving a free copy doesn't sway my opinion on the book. I received Simmons' book in the mail within a week and had devoured it within two days. She's irreverent and honest. She uses plenty of profanity, so if that's not your thing, I'd consider skipping this one. In spite of her sailor's vocabulary, she is hilarious. I laughed out loud many times, something you do not expect when reading a book about North Korea. Simmons particularly focused on the spurious nature of everything she saw. When you travel to NoKo, you are almost never alone. Your trip is meticulously scheduled and you are constantly accompanied by handlers whose job it is to convince you how great NoKo is. Simmons expresses over and over how frustrating it was to continually be faced with both obvious lies and scenarios with deeply murky relationships with truth. She never knew what was real; everything from words spoken to "regular people" spotted to children's behavior...it all lacked authenticity. This, obviously, can drive a person crazy, particularly when they are immersed in it for 10 days, as Simmons was. True to herself, she compiled a "Sh*t I Think Might Be Real" list to document moments where she felt she may have seen through the facade. It's a short list. I would be remiss if I talked about this book without mentioning the stunning photography Simmons includes. She is a wonderful photographer and she captured some really gorgeous images. The book is filled with them. There is a photo on nearly every page. They are colorful and poignant, capturing the ethos of her trip better than her words at times. 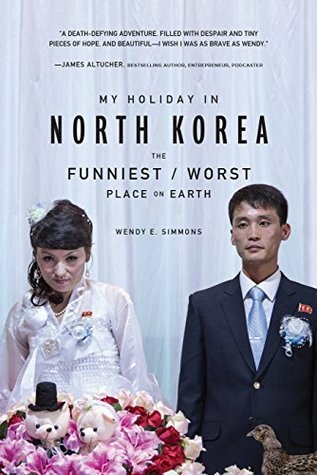 They are an integral part of her story telling and they make the book unique, particularly since so few candid photographs come out of NoKo at all. Quote I Loved: "North Korea is easy to hate and categorize as evil, because it is. And it's particularly easy to make fun of because so many things about it are so...ridiculous. But, assuming that North Koreans are the same as North Korea is a mistake. Just like us, they're only human. Separate from the Party, and apart from their Dear Great Leaders, North Koreans are real people." Will I Re-Read: Yeah, I probably will. Even if just to look at her gorgeous photos. A Reduced Review: Irreverent and honest, Simmons is the antithesis of North Korea itself; thus, her travel memoir about her time in the country is unique, fascinating contrast.